Allow me to introduce you to Adams absolute favorite dessert that I make. The recipe for these delicious bar cookies comes from one of my most loved cookbooks, "Baking From My Home To Yours" by Dorie Greenspan. This has basically been my bible for baking since my brother gifted it to me for my birthday 9 years ago. If you're on the market for a great cookbook that focuses on pies, tarts, cookies, cakes and everything in between, I highly suggest you look into this gem. 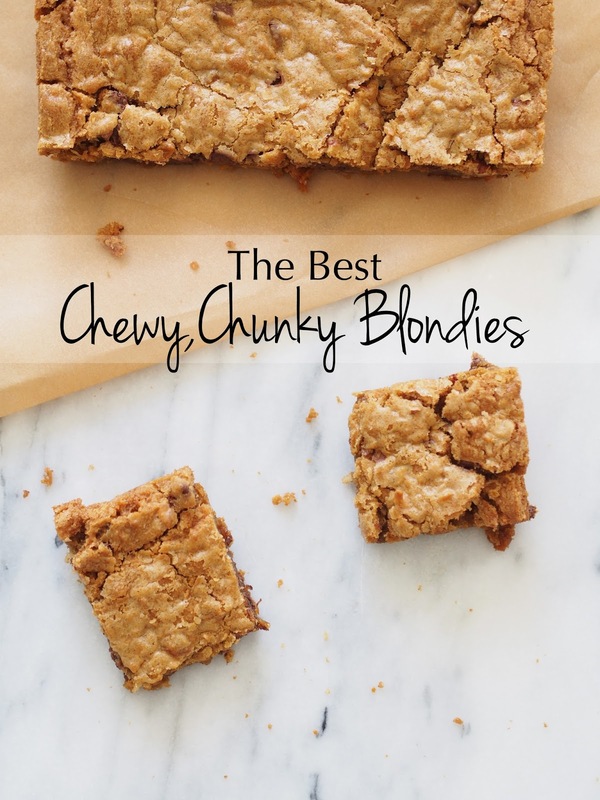 If you've never made blondies before, let me affirm that that are so easy to throw together and this version is d-a-n-g-e-r-o-u-s! They are richly flavored with notes of chocolate, butterscotch, coconut flakes, and pecans for a bit of crunch. Bet you can't eat just one! Hope you like these as much as we do. Preheat oven to 350 degrees F. Butter a 9x13 inch baking pan and put it on a baking sheet. Using a stand mixer with the paddle attachment, beat butter on medium speed until smooth. Add in both sugars and beat for another 3 minutes, or until well incorporated. Next, add in the eggs one at a time, beating for 1 minute after each addition, then beat in the vanilla. Reduce the mixer speed to low and slowly add in the dry ingredients, mixing until well combined. Using a rubber spatula, stir in the chips, nuts, and coconut. Scrape the batter into the buttered pan and use the spatula to even the the top out. Bake for around 40 minutes, or until a knife inserted into the center of the blondies comes out clean & the blondies are starting to pull away from the sides of the pan. The top should be a nice golden brown color. Transfer the pan to a baking rack, run a knife around the edges, and allow to cool to room temperature before serving. Yum!!! these sound so good!! So yummy! Can't wait to make these for my hubby!